Projector works great with no dead pixels or any noise in the output. NO LENS INCLUDED. NO LENS INCLUDED. Item is heavy, weighing in around 40 lbs. Good luck! Trending at $293.37eBay determines this price through a machine learned model of the product's sale prices within the last 90 days. Low Hours Digital Projection WXGA HD Theater / Church Projector - 6000 Lumens! Up for sale: Digital Projection 6000-WXGA projector. Notes: Native WXGA large venue projector. Low hours, great picture and super bright! There is no lens included. Support 1080P And 4K Video Display. In addition, it supports Full HD 1080P (1920 1080) and 4K video playing. 1920 1080, HD 1080P，4K. With HDMI / USB / AV / Headphone / VGA / TF Card Interfaces. Built-in New Version Android 6.0.1 OS. • (1) - VGA CABLE. Projects a bright sharp image. Both lamp hours are 1500hr. Remote not included. Front panel not included. Video Modes: 1080i, 720p, 480p, 480i. This projector has been tested and found to be in good working condition. The projected display is full color, bright and easy to read. The projector usage hours are : 1218. Brand Unbranded/Generic MPN Does not apply Native Resolution WXGA (1280x800) Display Technology 3LED Contrast Ratio 2000:1 Aspect Ratio 4:3 and 16:9 Projection Screen Size (inch) 32-200 inches Projection Distance (m) from 1.2 to 6m Throw Ratio Range 150-400 Connectivity Wired Brightness(Lumens) 5000Lumens Input Voltage(V) 110V-240V AC UPC Does not apply UPC Does not apply. Mfr Part #: X600. X600 DLP Projector. Graphic Mode: XGA. Standard Mode Brightness: 6000 lm. 3D Type: 3D. Projection Lens. HDMI Version: HDMI 1.4a. Minimum Lens Aperture: F/2.6. 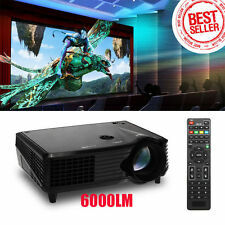 Epson PowerLite Pro Z8000WU Full HD 1080p WUXGA Theater Projector - 6000 Lumens! Notes: Native full HD WUXGA large venue projector. Looks good. Professional high-end 3LCD unit, great picture, super bright! There is no lens included. Standard throw zoom lens 1.7-2.8:1. Features: Brand Unbranded/Generic UPC Does not apply MPN MY10EVZC47680002 Native Resolution 1280x800 / Support 1080P Operation System Android 4.4 OS Image Brightness 5000 ANSI Lumens Contrast Ratio 6000:1 Features Bluetooth,, Built-In Speakers, Rear Projection Video Inputs HDMI Type Home Theater Projectors Connections HDMI, VGA, AV, USB 3D Capability 3D-compatible. 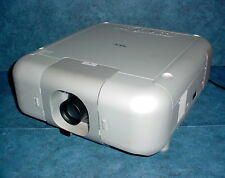 Used Panasonic PT-DZ6710U Conference Presentation Projector 1920x1200 DLP WUXGA. 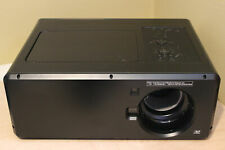 This Perfect working, good, clean condition, Panasonic PT-DZ6700 1920x1200 Native (WUXGA) DLP projector. (( Manufacture Date May - 2013)). Used, good physical condition. Tested - Works! Lamp 1 and 2 both show 1501 hours. No manual, remote, cables, lens, ethernet card or other accessories. Display Type : 0.9" DLP (3). Panasonic PT-DW7000U Projector Specifications. THIS PANASONIC PT-D6000ULS LARGE VENUE PROJECTOR IS IN VERY GOOD WORKING CONDITION WITH MINIMAL BUFFS AND SCRATCHES FROM NORMAL USE. PROJECTOR LAMP 1 HAS 1173 USAGE HOURS AND LAMP 2 HAS 1173 USAGE HOURS. In good working condition ,it will need a lens. Local pickup is available. Style: DLP. The RGB Booster achieves high image quality with levels of color reproduction (up to 145% that of conventional models) and brightness that make each color stand out. Gamma curves and sharpness, in addition to conventional color correction are adjusted to bring a sense of sharpness to the entire screen and reproduce stunning images with life-like depth. Three reasons to consider this one. LCD is superior in image quality, it always has been, always will be. DLP has always been inferior. The #1 enemy of all projectors is heat. This series is BIG. THIS PANASONIC PT-DW640US LARGE VENUE PROJECTOR IS IN VERY GOOD WORKING CONDITION WITH BUFFS AND SCRATCHES FROM NORMAL USE. THE PROJECTOR ALSO HAS FOUR SMALL HOLES ON THE TOP OF THE PROJECTOR AS PART OF A CUSTOM MOUNT THAT WAS ON THE PROJECTOR. Full set, only a few hours use on the projector. Panasonic PT-D6000US Projector Specifications. 0.7" DLP (1). Projector Size Used, good condition. Tested - Works great! Includes Standard Lens XGA/WXGA (TKGF0109-5). Total Operation Hours = 2242. An automatically cleaned filter combined with the sealed optical area makes this projector easy to keep up and low-maintenance. With a contrast ratio of 2,000:1, image displays from this DLP projector are colorful and clearly defined. Panasonic PT-DZ6700 Projector. We have experienced Projector Technicians on staff and we have been in the industry for over 5 years. INCLUDED ACCESSORIES: Power cable only. The warranty is to cover you in case the item does not function as it should for the condition it is in. PANASONIC PT-EX600 EX600U Projector,6000 LUMENS! LOW HOURS,NEWLY INSTALLED LAMP! Panasonic PT-EX600 Projector with ET-ELS20 lens installed. We have experienced Projector Technicians on staff and we have been in the industry for over 5 years. INCLUDED ACCESSORIES: Power cable and the ET-ELS20 lens installed. 4 out of 5 stars - PANASONIC PT-EX600 EX600U Projector,6000 LUMENS! LOW HOURS,NEWLY INSTALLED LAMP! 4 product ratings4 product ratings - PANASONIC PT-EX600 EX600U Projector,6000 LUMENS! LOW HOURS,NEWLY INSTALLED LAMP! Christie Projector DWU670-E. WUXGA 1920 X 1200. Fully Tested. Image Quality is EXCELLENT, Total Hours 3984. Power cable included. No remote. Aspect Ratio : 16:10 (WUXGA). Christie DWU670-E Projector Specifications. PANASONIC PT-EX600 EX600U Projector,6000 LUMENS! LOW HOURS,NEW INSTALLED LAMP! Panasonic Projector PT-D6000. Fully Tested. Fully Functional. Everything Works. Excellent image quality! VERY BRIGHT! No warranty. XGA (1024 x 768) Native Resolution. Native Chip Resolution 1024 x 768 (XGA). Lens f/1.5 - 1.7 (f = 20 - 31.8 mm). Lens Shift Vertical: ± 50%. Light Source Laser Phosphor. Standby Mode (Lamp Off): 2 W.
Mfr Part Number: X600. 3D Support: Full 3D - The 3D features of Optoma projectors can only be used with compatible 3D content. Resolution: XGA 1024 x 768. Computer Compatibility: UXGA, SXGA, XGA, SVGA, VGA, Mac. SANYO PLV-WF20 6000 LUMEN HD WIDESCREEN LCD PROJECTOR - 0HR GENUINE LAMPS! Projector is clean inside and out, as is the entire light path, and LCD Prism assembly. (See Photos). Note : The adjustable feet for this projector are missing, as the projector was ceiling mounted and the feet need to be removed for the ceiling mount to attach to the projector.There are no adjustable feet, and no ceiling mount included. The Panasonic PT-EX600U LCD Projector with Lens provides high brightness and good contrast in spite of its compact body. It also features an ecological design that lowers power consumption, flexibility in installation, and easy maintenance. At just 3cm (1.18 in.). MFG Part #: S1. The S1 has an instant On/Off capability as there is no need for the LED light source to warm up or cool down. ASUS designers penned the S1's Zen-inspired lines and gave its sleek; modern chassis a stylish concentric-circle finish. The WU515T large venue projector produces Full HD quality images for sharper, clearer images and presentations. 1920 X 1200. New Other. This brings you crisp and accurate images in your every presentation! SU931 1.6x big zoom feature opens up space with an impressively wide range of throw distances. All you have to do is simply place the new projector right where your original ceiling mount is. New.NEC NP-PX602UL-BK. The NEC NP-PX602UL-BK isNew in Box. Projection Distance 2.58 to 114.9 ft. / 0.79 to 35.0m. Video Compatibility NTSC, NTSC4.43, PAL, PAL-60, PAL-M, PAL-N, SECAM. Contrast Ratio 10,000:1 with auto iris. A built-in 16W speaker eliminates the need for an external sound system. The included SL-63 standard lens has a 1.54-1.93 (WUXGA) throw ratio. Lastly, the lens is capable for projecting large images and the 211" maximum diagonal display ensures that even in a large venue, everyone will be able to see your presentation. The NEC projector is a great advanced installation projector perfect for the corporate world and higher education users. NEC NP13ZL NP13ZL - Zoom lens. What you need to know – This product may have a serial number that uniquely identifies the item. Condition is Used looks and works great. - 1.2:1 0.95" Lense. Projector has fairly low hours at 2458hrs. - Rigging Cage.